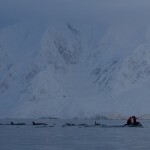 Yesterday was, for me at least, the highlight of our trip to the Antarctic Peninsula so far. It started out as a fairly typical day: sunrise at around 8:30, then starting visual surveys to look for whales to tag. listen to a portion of an interview where Ari describes both the personal and scientific excitement of our killer whale sighting in Flandres Bay. We are working on several podcasts describing our trip, but because we have limited bandwidth, we can send only an excerpt of this one while we are at sea. Check back for the full story (complete with more pictures) when we get back to land! We were working in Flandres Bay. They didn’t get around to sampling this bay last year, so we were interested in seeing what the whale abundance was like here. It seems that the area doesn’t have too much krill though, and we weren’t expecting too many whales since there is nothing to eat. We did however see several humpbacks in the area. Our big surprise though came on our way back out of the bay. Our intrepid visual observer Lindsey spotted a killer whale dorsal fin. These guys apparently aren’t too common down here this time of year. We’ve only seen one other group on this trip and weren’t really expecting to see too many more. Since it was a pretty unique sighting we stopped the ship and put two small boats in the water to go and check the group out, get photo ID pictures and hopefully some biopsy samples. We jumped into the boat and raced over to find them. Our biopsier and tagger, Ari, made the memorable last comment that we weren’t likely to get anywhere near them because they usually take off when they see boats coming. These guys must have been feeling friendly today, or just wanted to prove Ari wrong. Almost as soon as the first boat got close, the group changed course and headed to check them out. 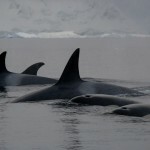 It was a large group of about 15 animals, of type B killer whales, which eat seals and other marine mammals. There was a large male in the group as well as a small baby, possibly only a month or two old. The adult males are distinctive with their very tall dorsal fins. 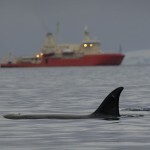 The large male in this group even had some rake marks on his dorsal fin, most likely from another killer whale’s teeth. You can see in this picture the tall fin of the male, as well as the relatively tiny baby that was in the group. They quite fearlessly approached the first boat incredibly closely, coming almost within touching distance. It was absolutely amazing, and a little bit intimidating, to see these large animals headed towards us at high speed. They push a pretty large bow wave in front of their heads when they are surfacing and moving fast. They swam around our boat for a short time, long enough to give us a thrill and for us to obtain some very cool and unique underwater videos of them that give us a more comprehensive look at their bodies, and may even allow us to determine the gender of several of the animals that swam right through the shot. We stayed with the group for a fair while. Ari managed several great shots with the crossbow, biopsying an adult male, adult female and a juvenile animal. This will give us a pretty good representation of the age classes in the group. Overall it was a pretty amazing day. We got some excellent photos and an experience that none of us are likely to forget anytime soon. Thank you for sharing your research and experiences with us. I can not imagine what it must be like to be that close to the orca whales, that is very cool and definatly a once in a lifetime experience! We discussed this article and the pictures in class today. It must be really exciting to see these whales in a natural environment, and also when they are not common to the area that time of year. 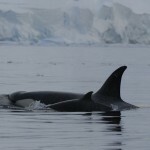 I would love to see killer whales in the wild, especially in Antarctica. These pictures are great! Just stopping by to say keep up the research and this new finding shows how much we still have to learn about the ocean and its animals! This experience sounds remarkable and I can’t wait to hear more. This was so interesting to read. It really gave me a cool image of what it was like. It must have been so amazing. I love the pictures. Food for thought? How long do whales live? What exactly does it mean to “biopsy” whales with a crossbow? Sounds fatal. I meant to refer to the animals, WHALES, not corduroy (wales)! I cannot believe how close you got to the orcas! What an experience! Thank you for all of your hard work and dedication to research! SO interesting to read about!